Spain’s new Socialist government has reportedly confirmed cancellation of the sale of 9.2 million euros’ worth of laser-guided smart bombs to Saudi Arabia because the bombs could be used by a Saudi-led coalition in the civil war inside Yemen, where the United Nations estimates more than 6,600 civilians killed and nearly 11,000 wounded since the conflict began in 2015. The reported cancellation, said to have been initiated in July by the administration of President Pedro Sánchez after less than two months in office, was revealed by Spanish news media late Monday. The news came just 24 hours before a meeting to discuss Spanish arms sales to the Saudis between Spanish Commerce Secretary Xiana Méndez and representatives of Spanish NGOs Amnistía Internacional España, FundiPau (Foundation for Peace), Greenpeace España and Oxfam Intermón, on behalf of the international Control Arms Coalition. The contract with the Saudis was negotiated in 2015 by then-Defense Minister ministro Pedro Morenés of the conservative Partido Popular (PP) administration of former President Mariano Rajoy and was signed last year by María Dolores de Cospedal, who succeeded Morenés in the Defense portfolio. According to the Control Arms Coalition, Spain is the fourth-largest supplier of armaments and military equipment to the Saudi regime in recent years. Amnesty International wrote in a March 2018 report that from 2015-2017, precisely the years covering the Saudi-led coalition’s participation in the civil war in Yemen, Spain exported 1.2 billion euros’ worth of military hardware to the Saudis. 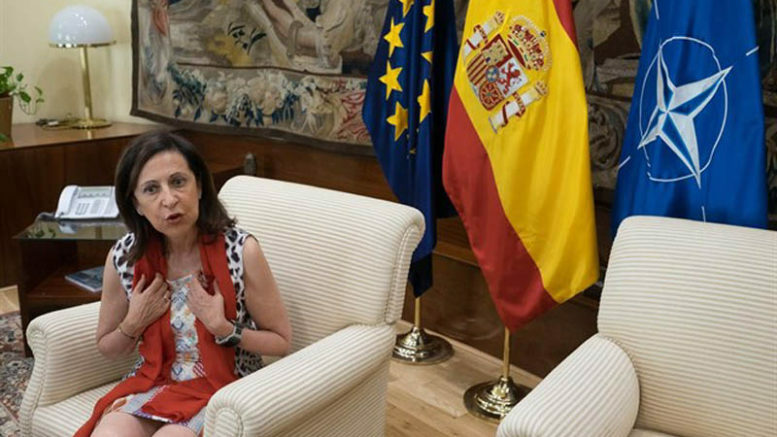 According to the Spanish news reports, the smart-bombs contract with the Saudis was frozen by Spain’s new Minister of Defense, Margarita Robles, whose ministry is returning the 9.2 million euros paid in advance by the Saudi regime. The bombs will remain stored in a Spanish military facility in Aragón, where they had been awaiting pickup and delivery to Saudi Arabia. In early August, an airstrike by Saudi coalition against Houthi rebels in Yemen using a U.S.-manufactured bomb mistakenly struck a school bus, killing 40 children. This week, the Saudis admitted the mistake and the civilian deaths in a rare apology for their actions in the Yemeni conflict. On 28th August, United Nations investigators issued a report in Geneva saying the U.S.-backed coalition led by the Saudis and the United Arab Emirates in Yemen has killed thousands of civilians in airstrikes and carried out other actions that may amount to war crimes. Forces led by Houthi rebels in Yemen may also be guilty of war crimes committed during the conflict, the UN report said.